Thai Boxing Started in 1650 when King Naresuen of Siam was captured by the burmese, he was offered freedom if he could defeat Burmese champions. He successfully defeated 12 of the finest Burmese boxers and became a national hero. This made Thai Boxing a national pastime. The actual origins may date back further but this is unknown due to the Burmese book burnings in 1776. 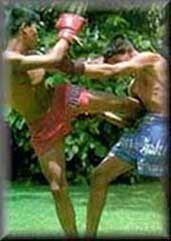 Thai Boxing is an adaptation of the Thai military arts. In peacetime the weapons of the battlefield were laid down and the soldiers would fight empty hand to keep their edge. At that time there were few rules, no rounds, and no weight classes. In this time period boxers fought barefooted, their fists and forearms wrapped in hemp rope and combat was extremely brutal. Training methods were vast and varied. Banana trees were kicked, kneed, and elbowed, softening the tree until it could be wrapped on the trainers arms for kicking. This is where the unique creation of the Thai pad got it's start. Thai Boxing also find much of it's root's in Buddhism. People who see Thai Boxing for the first time often wonder about the pre-fight ritual that takes place before every authentic Thai fight. This ceremony called the "Ram Muay" is a spiritual ceremony which seals off the ring from outside influences, pays homage to gods, parents, teachers, loved ones, king and country. A great deal of significance is placed on the Ram Muaysince it displays the spirit and heart of the fighter. Both the Ram Muay and the fight itself are accompanied by music from a four piece ensemble. The pace of the fight is often dictated by the music played on the side of the ring. Because the Thais quickly adapt to anything which may give them an edge, Thai Boxing has evolved towards greater efficiency for centuries. Most recently they have adapted various Western Boxing techniques, training methods, and strategies to their already formidable tools. In the past 50 years Thai Boxing has enjoyed even greater popularity. Modern western style gloves, weight classes, and 3-minute rounds have been adopted. Because of the rigorous nature of it's testing ground and the directness of it's techniques, Thai Boxing and Thai Boxers are some of the most highly respected martial artists throughout the world.